I was born in the South and grew up in Kansas. After Dan and I got married, the Navy took us to Florida, Texas, Oklahoma, then back to Florida, and finally back to our home state of Kansas when Dan went off active duty. Living in all those Southern states and growing up in Kansas, you would think I grew up on grits, but I actually didn’t taste grits until I was in college and would visit Dan’s family while we were dating. My kids, on the other hand, have grown up on grits. We eat a lot of beef in our family, usually in the form of tenderloin or strip steaks on the grill. I have a husband who will grill when the temperature is in the single digits! When I ask my family what “sides” they would like, the majority of the time they want my Cheesy Grits. 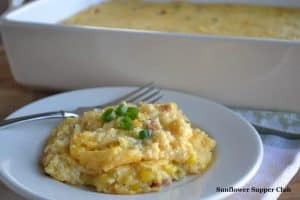 Don’t get me wrong — I LOVE plain Cheese Grits, but the foodie in me gets tired of not experimenting and trying to jazz it up. This version has a jalapeño pepper which is optional, and if you like spicy foods it is really good. If not, just leave it out, and the dish is still delicious. Remember, the more of the membrane and seeds of the pepper you use, the spicier the grits will be. Even if you don’t like spicy foods, use the Frank’s hot sauce. I think it gives the dish a great depth of flavor and doesn’t make the dish spicy. I’d love to know some of your favorite dishes that you or your children have grown up with! Cook diced bacon in a large skillet over medium heat until crisp. Remove bacon and set aside. Remove all but about 2 tablespoons of the bacon grease from the skillet. Add the corn, garlic, kosher salt, pepper, cumin and diced jalapeno (if using). Saute for about 5 minutes to let the flavors blend. Stir the bacon back into the corn mixture, remove from the heat and set aside. Meanwhile, bring the chicken broth to a boil in a large saucepan. Slowly whisk the grits into the boiling chicken broth. Cover and reduce the heat to low, cook grits for about 3 to 4 minutes until thickened. Remove the pan from the heat. Stir in the milk, melted butter, Franks, Worcestershire sauce and green onions. Add the Sharp Cheddar a little at a time, stirring until melted. Stir in the bacon and corn mixture. Crack the eggs in a small bowl and beat well. With your whisk add a little of your hot grits mixture to the eggs and stir. Working quickly, add the egg mixture to the grits and stir until the eggs are incorporated into the grits. You don’t want your egg to scramble, work quickly! Pour grits into a greased 9 x 13 inch pan. Bake at 350 degrees for about 45 minutes. I linked this recipe to the Weekend Potluck by The Country Cook, Meet Penny, 4 little Fergusons, and Baking Bad. Check it out for tons of yummy recipes! Thanks Tabitha! I have a lot of grit recipes and this is one of my favorites. Have a great week! Congratulations on the featured recipe today at Weekend Potluck! We are just loving your recipes!! I just pinned in to Pinterest! If you’d likem you can come grab a featured button to put on your post, if you’d like. Have a great weekend! Thanks so much Brandie! You gals are so great to host this every week. We are fairly new to this world and have met so many fantastic new “friends” through the Weekend Potluck. Thanks again to all of you for everything! I can’t wait to try this – I really love grits! Sounds like it would be perfect with pork chops or chicken. Can’t wait to try it! I think you will love it! It is fantastic with chicken or pork as well as beef. Pretty much anything. How can you go wrong with grits, cheese and bacon! Thanks so much for stopping by. I just poked around your blog for a few minutes. I can’t wait to go back and explore it further. Especially that Whopper Cake! I have Scouts in my home as well. Have a wonderful weekend! Oh my goodness! This looks fabulous! Wish I had seen this earlier. I made grits and green chile this morning and this would have been a nice change. Next time for sure! Thanks so much MJ! I loved poking around your blog, your pictures are fantastic! I’m still working on that. Have a great weekend!